In the senior boy’s division Arorangi showed what they had gained from the sessions with CIFA’s Technical Staff in the last six weeks. Arorangi did not waste time and scored in the first minute of the match shocking onlookers and supporters of Avarua School but Avarua School gained their confidence by scoring the equalizer one minute later. Arorangi School played with cohesion, good control and tactics to place the ball past Avarua goal keeper three more times while last year’s champions Avarua School scored two more goals with the final score four goals to three in favor of Arorangi. In the girl’s division Avarua showed why they were the reigning champions but there was stiff competition by Avatea School. Scoring opportunities were galore for Avatea but couldn’t put the ball past the goal keeper to take the game into penalty shootout. 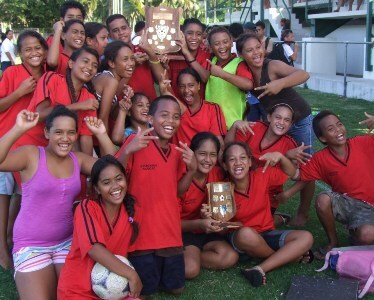 Avarua scored their first and only goal in the first half and went to win the senior girl’s division final for another year. The presentation of trophies and prizes was held straight after the boy’s finals. The Cook Islands Football Association would like to congratulate Arorangi and Avarua School in their achievement and would like to thank all schools who participated in this year’s Primary School Soccer Tournament for Forms One and Two and we look forward to seeing everyone next year.